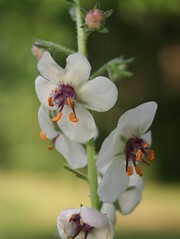 This flower is called Moth Mullein (Verbascum blattaria). 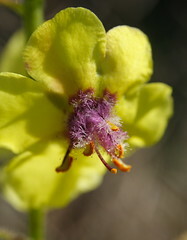 It gets its name from the fact that the fuzzy, purple stamens look somewhat like moth antennae. It comes in white or yellow. We have both varieties at Audubon. I snapped the yellow one along the Universal Trail near the building and the white one out on the embankment of Big Pond. This entry was posted in wildflowers. Bookmark the permalink. Ooooooooh I love the purple fuzz! It contrasts so nicely with the orange stamens. Nice photography! Great flowers, both! Have a grand time camping!